The tropical and semi-tropical zone is the focus of the productive assets of Resource Energy while the fuel intensive economies of the developed world are the largest consumers of such products. 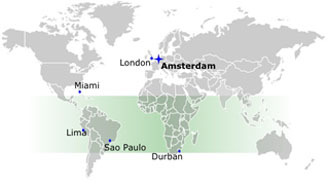 Resource Energy is headquartered in the Netherlands and has its Latin American operations in Miami. The focus of its initial development efforts are Latin America (including the Caribbean) and Africa. Marketing and trading will occur with the developed economies of Europe, North America and Asia.